The picture above is exactly like the bird that we saw in our garden. The other day on Wednesday 07/09/16, my wife and I, and family, who live here in Scotland, (UK), had the privilege of being visited by a very beautiful Seraphim bird, which we found out later originated from the USA. I have put the history of this bird and how it got its name, which we have traced back to North America below. Whilst sitting in our garden yet again, this time we had a beautiful experience, in seeing a rare bird arrive in our garden. 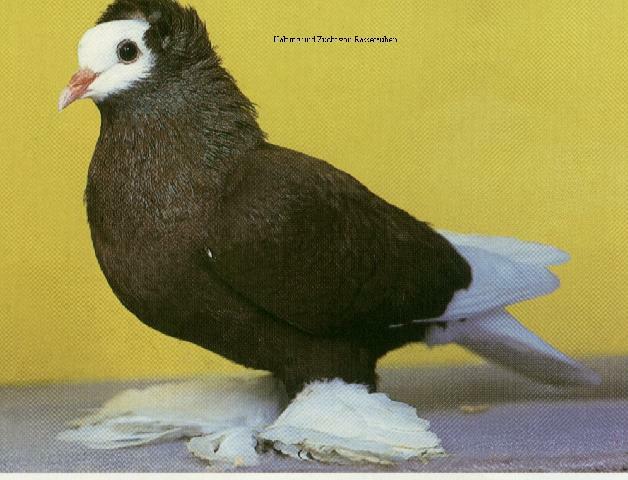 We had never seen such a bird before, and though looking like a cross between a dove and pigeon, it had extremely feathered feet. My granddaughter quipped, that it looked like it had a rooster's feet. The bird flew from our garage roof into the big tree in the centre of our small garden. It then flew onto one of the 2nd floor window-sills. It appeared to be reasonably tame. It then finally went, and perched on the top window to our bedroom, and promptly tucked its head in and went to sleep. Not suprising the timing as, it had just started raining outside. We didn't have the heart to close the window, as long as this beautiful and gentle bird, was still perched on our window-frame, so we simply just left the window wide open all night. When we awoke the next morning, the beautiful bird was still there. Then she awoke, and flew away, and we thought that was the last we would see this wonderful bird. But lo and behold, about half an hour later, the bird returned & flew right back onto our bedroom window-sill. Our 7 year-old granddaughter, who happened to be visitng from Spain with our daughter, her mother, really enjoyed this adventure with this rare bird. We decided to call for expert attention, and we called Scotland's only charity for the preservation and protection of birds. They sent a young man who was obviouly an expert with capturing escaped birds. He told us that it was very good that we had called them right away, as the bird was under-nourished. They promised to take good care of the bird and to re-house it with a good new bird-keeper. We took the fact that my wife and family were visited by such a beautiful and rare bird as a very good OMEN of BLESSING, which is much appreciated by us at the present time, when my wife has been in a wheelchair for the past 10 months, due to a very severe concussion, and I myself have recently been very sick with severe anemia. We hope that you liked this short article. Do return to this TOPIC TAB called "HEAVEN", as NEXT, I will write a detailed article about the real SERAPHIM, who guard the throne of God, and what they look like. ISA.6:1 In the year that King Uzziah died, I saw the Lord sitting on a throne, high and lifted up, and the train of His robe filled the temple. ISA.6:2 Above it stood seraphim; each one had six wings: with two he covered his face, with two he covered his feet, and with two he flew. ISA.6:3 And one cried to another and said: "Holy, holy, holy is the LORD of hosts; The whole earth is full of His glory!" ISA.6:6 Then one of the seraphim flew to me, having in his hand a live coal which he had taken with the tongs from the altar. When most people think of Cherubs they'll think of pudgy little baby-like creatures, with two little wings, who are rather cute. However, that's not how the Bible describes them! Cherubs (the correct pural is Cherubim) are described in two books of the Bible, Genesis and Ezekiel (a Jewish prophet). The prophet Ezekiel has a vivid vision of heaven where he sees many angelic beings. His description of the Cherubim is powerful – almost frightening 3. The Cherubim are also described in the construction of the 'Ark of the Covenant'. (Yes, the one out of the Indiana Jones film!) The Ark was the dwelling place of God with the Israelites during their exodus in the desert 4. The ark was placed in the Jewish Temple, when it was built in Jerusalem. The holy part of the Temple (where the ark was placed and where the highest alter was located) also featured statues of Cherubim 5. In Ezekiel's vision he also describes another type of angelic beings that seem to be associated with the Cherubim. Their description is even more strange, to our eyes 6. Certainly an amazing scene. Ezekiel's vision might seems strange, it might well be that human eyes and senses just can't properly describe the wonder of heaven. The Bible doesn't say how many Cherubim there are, but we're told that Ezekiel saw four - and there may be more than that! Their role is to guard God's Holy domain and presence from any sin and corruption. They are sometime known as the throne angels as they are seen to be around the throne of God 7. In Jewish folklore the 'Throne Angels' are known as Merkabah. The word Cherub may come from a term 'to guard' which would fit well with their role. No where in the Bible are the Cherubim actually called angels! EZE.1:4 Then I looked, and behold, a whirlwind was coming out of the north, a great cloud with raging fire engulfing itself; and brightness was all around it and radiating out of its midst like the color of amber, out of the midst of the fire. EZE.1:5 Also from within it came the likeness of four living creatures. And this was their appearance: they had the likeness of a man. EZE.1:6 Each one had four faces, and each one had four wings. EZE.1:7 Their legs were straight, and the soles of their feet were like the soles of calves' feet. They sparkled like the color of burnished bronze. EZE.1:8 The hands of a man were under their wings on their four sides; and each of the four had faces and wings. EZE.1:9 Their wings touched one another. The creatures did not turn when they went, but each one went straight forward. EZE.1:10 As for the likeness of their faces, each had the face of a man; each of the four had the face of a lion on the right side, each of the four had the face of an ox on the left side, and each of the four had the face of an eagle. EZE.1:11 Thus were their faces. Their wings stretched upward; two wings of each one touched one another, and two covered their bodies. EZE.1:12 And each one went straight forward; they went wherever the spirit wanted to go, and they did not turn when they went. EZE.1:13 As for the likeness of the living creatures, their appearance was like burning coals of fire, like the appearance of torches going back and forth among the living creatures. The fire was bright, and out of the fire went lightning. EZE.1:14 And the living creatures ran back and forth, in appearance like a flash of lightning. EZE.1:15 Now as I looked at the living creatures, behold, a wheel was on the earth beside each living creature with its four faces. EZE.1:16 The appearance of the wheels and their workings was like the color of beryl, and all four had the same likeness. The appearance of their workings was, as it were, a wheel in the middle of a wheel. EZE.1:17 When they moved, they went toward any one of four directions; they did not turn aside when they went. EZE.1:18 As for their rims, they were so high they were awesome; and their rims were full of eyes, all around the four of them. EZE.1:19 When the living creatures went, the wheels went beside them; and when the living creatures were lifted up from the earth, the wheels were lifted up. EZE.1:20 Wherever the spirit wanted to go, they went, because there the spirit went; and the wheels were lifted together with them, for the spirit of the living creatures was in the wheels. EZE.1:21 When those went, these went; when those stood, these stood; and when those were lifted up from the earth, the wheels were lifted up together with them, for the spirit of the living creatures was in the wheels. EZE.1:22 The likeness of the firmament above the heads of the living creatures was like the color of an awesome crystal, stretched out over their heads. EZE.1:23 And under the firmament their wings spread out straight, one toward another. Each one had two which covered one side, and each one had two which covered the other side of the body. EZE.1:24 When they went, I heard the noise of their wings, like the noise of many waters, like the voice of the Almighty, a tumult like the noise of an army; and when they stood still, they let down their wings. EZE.1:25 A voice came from above the firmament that was over their heads; whenever they stood, they let down their wings. EZE.1:26 And above the firmament over their heads was the likeness of a throne, in appearance like a sapphire stone; on the likeness of the throne was a likeness with the appearance of a man high above it. EZE.1:27 Also from the appearance of His waist and upward I saw, as it were, the color of amber with the appearance of fire all around within it; and from the appearance of His waist and downward I saw, as it were, the appearance of fire with brightness all around. EZE.1:28 Like the appearance of a rainbow in a cloud on a rainy day, so was the appearance of the brightness all around it. This was the appearance of the likeness of the glory of the LORD. So when I saw it, I fell on my face, and I heard a voice of One speaking. EZE.10:1 And I looked, and there in the firmament that was above the head of the cherubim, there appeared something like a sapphire stone, having the appearance of the likeness of a throne. EZE.10:2 Then He spoke to the man clothed with linen, and said, "Go in among the wheels, under the cherub, fill your hands with coals of fire from among the cherubim, and scatter them over the city." And he went in as I watched. EZE.10:3 Now the cherubim were standing on the south side of the temple when the man went in, and the cloud filled the inner court. EZE.10:4 Then the glory of the LORD went up from the cherub, and paused over the threshold of the temple; and the house was filled with the cloud, and the court was full of the brightness of the LORD'S glory. EZE.10:5 And the sound of the wings of the cherubim was heard even in the outer court, like the voice of Almighty God when He speaks. EZE.10:6 Then it happened, when He commanded the man clothed in linen, saying, "Take fire from among the wheels, from among the cherubim," that he went in and stood beside the wheels. EZE.10:7 And the cherub stretched out his hand from among the cherubim to the fire that was among the cherubim, and took some of it and put it into the hands of the man clothed with linen, who took it and went out. EZE.10:8 The cherubim appeared to have the form of a man's hand under their wings. EZE.10:9 And when I looked, there were four wheels by the cherubim, one wheel by one cherub and another wheel by each other cherub; the wheels appeared to have the color of a beryl stone. EZE.10:10 As for their appearance, all four looked alike-as it were, a wheel in the middle of a wheel. EZE.10:11 When they went, they went toward any of their four directions; they did not turn aside when they went, but followed in the direction the head was facing. They did not turn aside when they went. EZE.10:12 And their whole body, with their back, their hands, their wings, and the wheels that the four had, were full of eyes all around. EZE.10:13 As for the wheels, they were called in my hearing, "Wheel." EZE.10:14 Each one had four faces: the first face was the face of a cherub, the second face the face of a man, the third the face of a lion, and the fourth the face of an eagle. EZE.10:15 And the cherubim were lifted up. This was the living creature I saw by the River Chebar. EZE.10:16 When the cherubim went, the wheels went beside them; and when the cherubim lifted their wings to mount up from the earth, the same wheels also did not turn from beside them. EZE.10:17 When the cherubim stood still, the wheels stood still, and when one was lifted up, the other lifted itself up, for the spirit of the living creature was in them. EZE.10:18 Then the glory of the LORD departed from the threshold of the temple and stood over the cherubim. EZE.10:19 And the cherubim lifted their wings and mounted up from the earth in my sight. When they went out, the wheels were beside them; and they stood at the door of the east gate of the LORD'S house, and the glory of the God of Israel was above them. EZE.10:20 This is the living creature I saw under the God of Israel by the River Chebar, and I knew they were cherubim. EZE.10:21 Each one had four faces and each one four wings, and the likeness of the hands of a man was under their wings. EZE.10:22 And the likeness of their faces was the same as the faces which I had seen by the River Chebar, their appearance and their persons. They each went straight forward. In the final book of the Bible, Revelation, there's a description of 'Four Living Creatures' 8. These amazing creatures have features in common with both the Seraphim, in having six wings and continually praising God; and like the Cherubim, that they number four, are covered in eyes and look like a lion, ox, man and eagle. Whether these creatures are Seraphim, Cherubim or another sort of angelic/heavenly being, we simply don't know. But they are certainly amazing and very powerful. REV.4:6 Before the throne there was a sea of glass, like crystal. And in the midst of the throne, and around the throne, were four living creatures full of eyes in front and in back. REV.4:7 The first living creature was like a lion, the second living creature like a calf, the third living creature had a face like a man, and the fourth living creature was like a flying eagle. REV.4:8 The four living creatures, each having six wings, were full of eyes around and within. And they do not rest day or night, saying: "Holy, holy, holy, Lord God Almighty, Who was and is and is to come!" "I was playing around with oldfashioned, long-faced Oriental Frills and surprise! I got a beautiful combination that turns white with the first molt. I was so impressed with the beauty of these angelic birds that I named them "Seraphim." 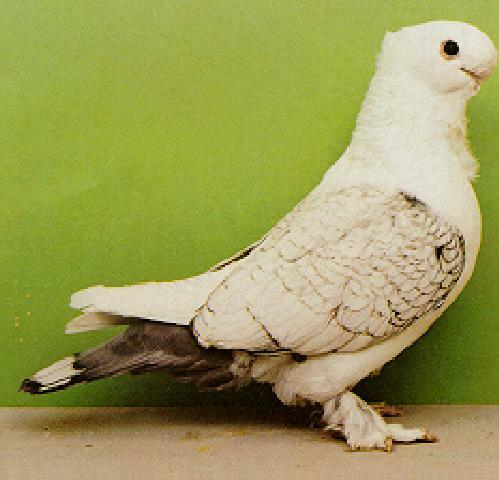 But Seraphim are not your regular, pigeon-type of angel because, although they look white, they are actually genetically recessive red and recessive yellow! confused? Don't be, it's really very simple. Imagine an angelic bird that has a touch of magic...."
The Seraphim were created from what Anne calls old fashioned Oriental Frills. These old fashioned frills have longer faces and are much slimmer than the Oriental Frills exhibited at shows today. Today's Oriental Frills' beaks are too short to be effective parents to their own young, and foster parents are required to raise them. Because of the longer beak,the old fashioned Oriental Frills are quite capable of feeding their own young.. The Seraphim has retained this desirable quality of the old fashioned Oriental Frills, and are also quite capable of taking care of their young..
As Anne stated, the Seraphim are all genetically recessive red or recessive yellow, but at maturity manifest the Seraphim's white angel color. As young birds, before the first molt, they show patches of this underlying yellow or red color, and look quite jolly and playful. It is not until after the first, and in some rare stubborn cases the second molt, that the magic occurs and they gain their angelic pure white appearance. 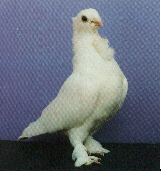 They have also kept the frill, peak crest, mane, slipper-like grouse feet and the gentle temperament of the old Oriental Frills, but have gained and an elegant form and unique head structure. Anne describes the grouse-type feathering on their feet as white stars and it is not hard to see why. She has created the perfect combination of grace and beauty and kept a touch of magic, making this breed worthy of the name Seraphim. A Seraphim, in case you are wondering, is a six-winged angel that guards the throne of the Lord. 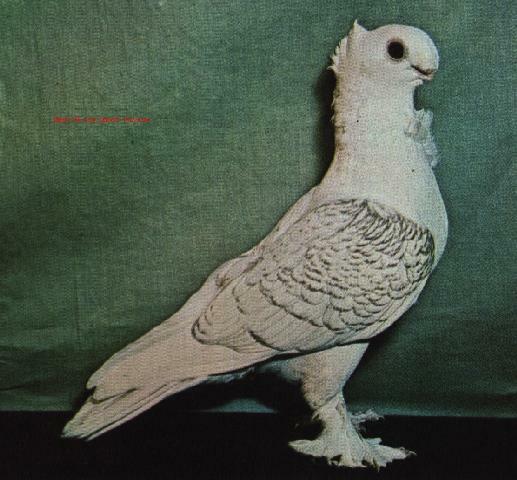 In January of 1995 the NPA unanimously adopted the Standard of Perfection for the Seraphim, and officially recognized the breed. Anne began with pigeons as pets. Her first breed was the Saxon Monk. She started the Seraphim project in 1986, and had placed over 170 young Seraphim in new homes by 1995. She remains passionate about what makes a this perfect bird. They are living, moving, works of art. I do not know if they have yet made it abroad, but I would be surprised if they have not. They are, after all, adorable. HEAVEN IS REAL, AS WELL AS INCREDIBLY BEAUTIFUL & A VERY HAPPY & FULFILLING PLACE, WHERE YOUR DEEPEST DREAMS WILL FINALLY BE FULLY REALIZED. 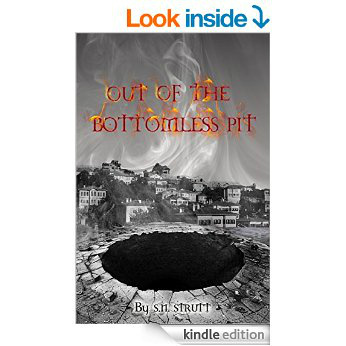 See new Author S N Strutt's new book which covers HEAVEN in great detail. I just watched this movie with my wife and teen daughters and we all liked it very much as we have had a large family of 11 children, & have experienced some of the sorrows brought out in this movie such as losing a baby. In this movie their son has a NEAR DEATH EXPERIENCE after being operated on for a burst Appendicitis. The boy describes HEAVEN in great detail after his traumatic operation ordeal. Truly a wonderful Near Death Experience which has already inspired millions of people around the Globe to realize that Heaven is REAL and that Jesus is real as well as angels and that more than anything else GOD is LOVE and is very forgiving. A truly a beautifully heart-wrenching tear-jerker of a movie. Best True-Life Drama film in many years- Steve N S.
But my inner self still existed, in defiance of all the known laws of science. For seven days, as I lay in that unresponsive coma, my consciousness went on a voyage through a series of realms, each one more extraordinary than the last — a journey beyond the physical world and one that, until then, I would certainly have dismissed as impossible. Heaven is as vast, various and populated as earth is ... in fact, infinitely more so. But in all this vast variety, there is not that sense of otherness that characterises our world, where each thing is alone by itself and has nothing directly to do with the other things around it.